I grew up in the sprawling metropolis of Boring Oregon. I studied at Oregon State, where I earned a bachelor’s degree in Business Management with a minor in Construction Engineering Management. During my summer breaks I began working in the construction industry, starting at the bottom with my two closest pals, the broom and the shovel. I enjoyed the hard work, and realized it was a good fit for me. After working for other businesses, I found Essex, where I’m a Project Engineer. I appreciate the level of professionalism here at Essex, combined with a caring, family atmosphere. It’s great to be able to get to know the owners and my coworkers on a personal level. I’ve always had a passion for sports and being active. 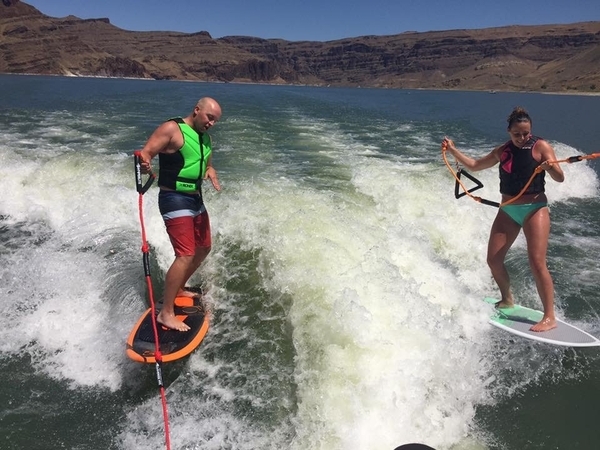 During the summers, I go wakeboarding on the Columbia and on the Owyhee Reservoir, and like to try and get out on the golf course as much as possible. In the winter, I ski and snowboard, and again try to get out on the golf course as much as possible. Throughout the year I play on a men’s league hockey team, and always make time for at least one bow hunting trip. Fortunately, my wife shares my passion for sports and the outdoors, and joins me in many of these outings.